Since January 2011 Truman has had a local foods coordinator working on campus, a position currently occupied by Garrett Grider who is in the process of finishing his Truman degree. As the local foods coordinator, Grider is responsible for overseeing the production of approximately six acres of fruits and vegetables at the University Farm. Additionally, he works to sell the produce on campus during the “Market on the Mall” every Wednesday, and also to the dining halls. 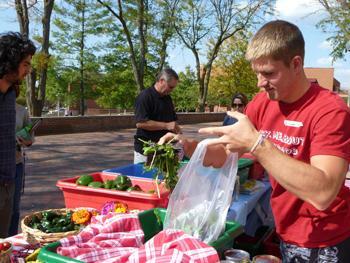 Garrett Grider bags greens during the weekly Market on the Mall. The local foods coordinator position is part of the larger “Farm-to-College as a Catalyst for Specialty Crop Production” project Truman has been cultivating since Fall 2010 through a grant from the USDA. The goal of the USDA grant was to promote the production of specialty crops, and Truman’s proposal was designed to build a demand and supply for locally grown food. So far this semester, Sodexo has purchased about $11,000 in locally grown products that have been served to the entire campus community as well as several catered events serving campus and the Kirksville community. Funding for the project comes from the USDA grant, with matching support from the University and in-kind work. Due to the structure of the grant, technically Grider is an employee of Sodexo. The University contracts with the food service provider, which then uses the funding to hire a local foods coordinator. The grant, scheduled to run through March 2013, also allowed for two interns in Summer 2011 and three interns in Summer 2012. 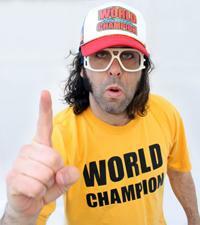 The Student Activities Board will host actor, writer and stand-up comedian Judah Friedlander as the Fall Comedian at 7 p.m. Nov. 3 in Baldwin Auditorium. His instructional karate book “How To Beat Up Anybody,” is based on his stand-up act. Doors will open at 6:30 p.m. The event is free for students and $5 for staff and general admission. Tickets are available now in the SAB Office located on the bottom floor of the Student Union Building. Not just any average pageant, Alpha Phi Omega will host its national fundraising non-beauty pageant Ugly Man on Campus (UMOC) at 7 p.m. Nov. 8 in Baldwin Auditorium. All organizations across campus may enter one participant, male or female, in the event. Contestants will be judged on quirky and funny characteristics, instead of a more traditional beauty-centered approach. There will be an ugly evening wear portion, interviews and an unusual “ugly” talent session. Full proceeds from the event will be contributed towards charity. Half of the money raised will go to the winning organization’s charity of choice and the second half will go to the charity of Alpha Phi Omega’s choosing. Alpha Phi Omega will sponsor penny wars from 10-3 p.m. from Oct. 29-Nov. 7 and Nov. 5-8 in the Student Union Building, Magruder Hall, McClain Hall and Violette Hall. Tickets will be available at these locations as well and can be purchased for $2 in advance and $3 at the door. For more information, and to participate in the event, contact the UMOC co-chairs at apo.epsilon.umoc@gmail.com. Students in HLTH 150 Nutrition for Health and Wellness, taught by Janice Clark, associate professor of health science, conducted a food drive Oct. 1-7 as their course service project. The class raised $1,804.31, as well as 193 jars of peanut butter and two large boxes of food. The money and food were donated to the Food Bank of Central and Northeast Missouri, with the proceeds to directly benefit the Buddy Pack program and the three food pantries in Adair County. The project was a service-learning requirement for Clark’s course. 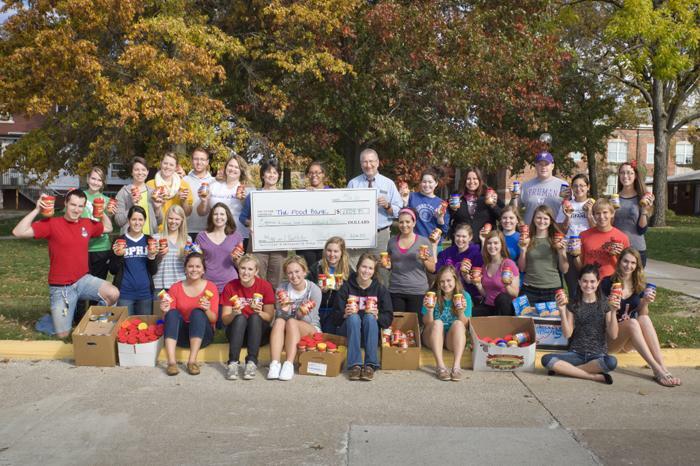 Students were challenged to raise more than the $1,200 collected by the 2011 Nutrition class. On the Truman campus, the HLTH 150 students worked at multiple tables Oct. 1-5, asked their peers to donate the money they might have spent on coffee or a soda, and collected more than $500. They also asked for donations at the entrances of the Kirksville Hy-Vee Food Store Oct. 6-7, raising nearly $1,300. Mike DiSantis, regional coordinator from the Food Bank of Central and Northeast Missouri, accepted the money and food donations Oct. 16. Characters of all kinds will be converging on the Truman campus and downtown Kirksville for the Oct. 27 Zombie Walk, an event intended to bring added awareness to the issue of disaster preparedness. Sponsored by the Truman Institute and “Zombie Scholars Academy,” the event is open to the public and starts on the Truman Mall with registration and a performance by Illusion Danz. Participating zombies will join the procession, dragging themselves through campus and down Franklin Street. Zombies reach their final destination, Picker’s Famous, at 5:30 p.m., where limited seating will be available for a 6 p.m. showing of George Romero’s “Night of the Living Dead,” and a preceding performance by True Men. A donation of two non-perishable food items is required to participate in the zombie walk and proceeds will be donated to the United Way. Cash contributions, in lieu of food items, are acceptable and will also be donated to the United Way. Admission to the film requires two non-perishable food items, if not already donated for the walk. Appropriate zombie costuming and an apparent loss of motor control is expected of all participants, and an adult should accompany children under the age of 13. “The Zombie Scholars Academy” is a new summer youth academy designed by the Truman Institute which aims at fostering critical thinking and problem solving skills by situating students in a hypothetical zombie apocalypse. The Institute is working cooperatively with various health professionals, researchers and literary figures to launch the new program and focus attention on disaster preparedness, as well as a range of topics in both the sciences and the humanities. People interested in the Zombie Walk can learn more by visiting zombie.truman.edu/media/walk/ or by calling 660.785.5384. Students interested in presenting their research to members of Congress in Washington, D.C., can get financial support through Truman’s Office of Student Research (OSR). Every year, the Council on Undergraduate Research (CUR) hosts a poster session highlighting undergraduate research to members of Congress. CUR chooses only two students from each state to attend the conference. The OSR will pay for travel for any student that is selected. Information about how to apply to present research in Washington is available at cur.org/conferences_and_events/student_events/posters_on_the_hill_information_for_submission. Students should also submit a copy of their application to the OSR at osr@truman.edu. Competitive applications will demonstrate accessibility of the research to a non-specialist and excellent communication skills. The submission deadline is Nov. 1. Questions about the application process can be directed to Joe Visker, OSR Steering Committee member, at jvisker@truman.edu. The Truman Institute is sponsoring TruLifesaver, an American Heart Association basic life support course, Oct. 23, 27 and 30. The course is designed to help recognize and respond to several life-threatening emergencies, provide CPR, use an AED and relieve choking. Truman instructors Liz Jorn and Jana Arabas will oversee the course, which is open to all members of the Truman and Kirksville communities. The $60 course cost covers instruction materials and a two-year certification with the American Heart Association. TruLifesaver will be offered three times: 5-10 p.m. Oct. 23; 8 a.m.-1 p.m. Oct. 27; and 5-10 p.m. Oct. 30. All classes will take place in the Health Science Building 1206. To register, visit institute.truman.edu/trulifesaver.asp and complete the online registration form, or contact the Truman Institute by phone at 660.785.5406 or email at institute@truman.edu. Interviews will be conducted once applications have been received. Applications are available online at career.truman.edu/Internships/mogovBrochure.asp. The first meeting of a new group for students with disabilities will take place at 7 p.m. Oct. 24 in the Student Health Center. Come meet and share ideas with other students with disabilities. Sponsored by Disabilities Services. The Study Abroad Office will host an information session for students interested in the Missouri-London Program. Hena Ahmad, professor of English, will speak about the program, along with Alexandria Witt, a Truman student who participated in the program. The session will take place from 4:30-6 p.m. Oct. 25 in Baldwin Hall 309. For additional information, stop by the Study Abroad Office, Kirk Building 114, or call 660.785.4076. Admission is $3 for Truman students with an ID and $5 for general admission. Oct. 25 receive $1 off with a canned food item. Oct. 28 is kids day from 1-3 p.m. Bring kids for a fun walk through the maze. There will be treats, as well as arts and crafts. Admission is $3 per child. For more information, email arl5816@truman.edu. Scholarship and volunteer positions are available now. Telecounselors assist high school students from their junior through their senior year by providing helpful information and advice about visiting Truman’s campus, completing the application process, understanding scholarships, making housing choices and more. Applications are located online at telecounseling.truman.edu, in the Office of Admission or by emailing jgraves@truman.edu. The deadline is 5 p.m. Nov. 9 in the Office of Admissions. TRU Strength is a free program designed to teach participants about adding variety to workouts, improving technique, learning new lifts, developing a training program and eliminating the plateau effect. Bring a workout buddy and meet in the weight room. Sign up at the weight room desk or email Staci Latham at slatham@truman.edu. Need Help with a Research Paper? Set up a RAP (Research Assistance Program) session with a subject librarian who can help you refine your topic and locate useful sources for your research project. To set up an appointment, email asklib@truman.edu or call 660.785.4051. CableTV is taking haiku submissions to be entered for their $1,000 scholarship. More information is available at cabletv.com/scholarship. Deadline to enter is Oct. 31. Creative Bioscience will be awarding a $1,000 scholarship in January. To enter, students must write a 300-500 word essay about any subject that interests them in the health industry, focusing on why it interests them, how they have learned from it or how it could be applied in their lives. Creative Bioscience is the industry leader for diet supplements and diet support services. Their business success depends on maintaining a positive brand image and delivering a quality product to the market. The Fitness Scholarship is designed to encourage and promote a healthier lifestyle and to help college students learn about healthy eating habits early. For more information, go to creativebioscience.com/blog/scholarship-application/. Deadline for application is Nov. 1. Truman’s Chapter of Beta Alpha Psi has been recognized by the organization’s Board of Directors as a Superior Chapter. The board noted that under the leadership of faculty advisor Kristen Irwin the Kappa Nu chapter excelled in the areas of academics, professionalism and leadership. The chapter will receive an award check of $275 sponsored by KPMG. Taner Edis, professor of physics, together with Sonja Brentjes, published “A Golden Age of Harmony? Misrepresenting Science and History in the 1001 Inventions Exhibit,” Skeptical Inquirer, 36:6 49-53 (2012). Michael Goggin, professor of physics, had his paper “Estimation of a quantum interaction parameter using weak measurements: theory and experiment,” accepted for publication as a Rapid Communication in Physical Review A, one of the premier international journals in physics. Rapid Communications are articles deemed significant enough to warrant accelerated publication. The article is the result of a collaboration with researchers from Asia, Australia and Europe. The collaboration grew out of his sabbatical at the University of Queensland, Brisbane, Australia. Katherine Jackson, associate professor of business administration, and Bryce Jones, professor of business administration, had their article “Reducing Textbook Costs: An Unconventional Approach,” accepted for publication in Business Education Innovation Journal. The article will appear in Vol. 4, No.2 , Dec. 2012. Bryce Jones, professor of business administration, and Theresa Presley of Kansas State University, were awarded the Distinguished Research Award at the Allied Academies Fall 2012 International Conference. Their paper, “Law and Accounting: Did Lehman Brothers Use of Repo 105 Transactions Violate Accounting and Legal Rules?” is the award winner for the Academy of Legal, Ethical and Regulatory Issues. The manuscript also has been accepted for publication in the Journal of Legal, Ethical and Regulatory Issues. Thomas Trimborn, professor of music, will have an article about the legendary John Philip Sousa appear in the October issue of The Instrumentalist Magazine, which has a worldwide circulation of 12,000 band and orchestra directors and students. Trimborn writes about Sousa the public relations genius, the well-crafted image he cultivated and the lessons to be learned in today’s world. Presidential Debate Watch Parties will be hosted Oct. 22 in the Student Union Building. The Service Board will host funding informational meetings at 6:30 p.m. Oct. 23 and Oct. 24 in Violette Hall 1416. Applications can be found online at serviceboard.truman.edu. Hard copy applications are to be submitted by 5 p.m. Nov. 12 to the Service Board mailbox in the Student Involvement Complex. For additional questions, email serviceboard.tsu@gmail.com. A new group for students with disabilities will host its first meeting at 7 p.m. Oct. 24 at the Student Health Center. The combined Student Health and Counseling centers will host an open house from 9 a.m.-10:30 a.m. Oct. 26 in the McKinney Building. Staff will be available to answer any questions regarding these support services. Refreshments will be served. Brian “Fox” Ellis will be the featured speaker in the Biology Seminar Series at 12:30 p.m. Oct. 26 in Magruder Hall 2001. 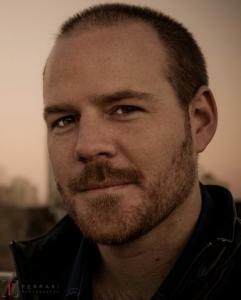 Ellis will portray Charles Darwin and his story of the Voyage of the Beagle. The third annual Community Partner Luncheon will take place at 12 p.m. Oct. 30 in the Student Union Building Georgian Rooms B and C.
“OFF the Record, An Exchange of Cultural and Educational Perspectives of African and American Studies,” will take place from 5:30-7 p.m. Oct. 31 in the Student Union Building Georgian Room C. This event is sponsored by the African Students’ Association. The deadline for a $2,000 scholarship to the University of Canterbury in Christchurch, New Zealand is Nov. 1. The scholarship is for Spring 2013. For more information, call 406.994.7044 or email alyson.roberts@montana.edu. The A.T. Still Research Institute is accepting applications for the Summer Research Experience. The undergraduate application deadline is Nov. 1. For more information, visit atsu.edu/research/index.htm. McNair Program applications are due Nov. 1. To view eligibility requirements and access the application, go to mcnair.truman.edu/apply.asp. The Pre-Law Club will host an event with The University of Missouri-Kansas City School of Law at 7 p.m. Nov. 7 (location TBD). Ellen Suni, dean of the UMKC School of Law, along with several faculty members and admissions counselors, will speak to students that may be interested in law school. Application fee waivers will be available at the meeting. Refreshments will be provided.